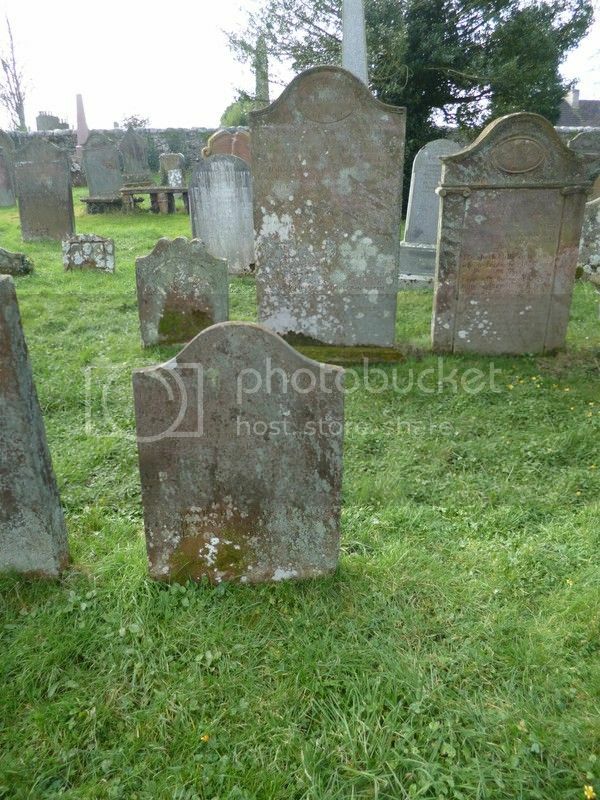 unusually I could not find any other graves with military inscriptions, largely due to the fact that there seem to be very few burials after about 1900. 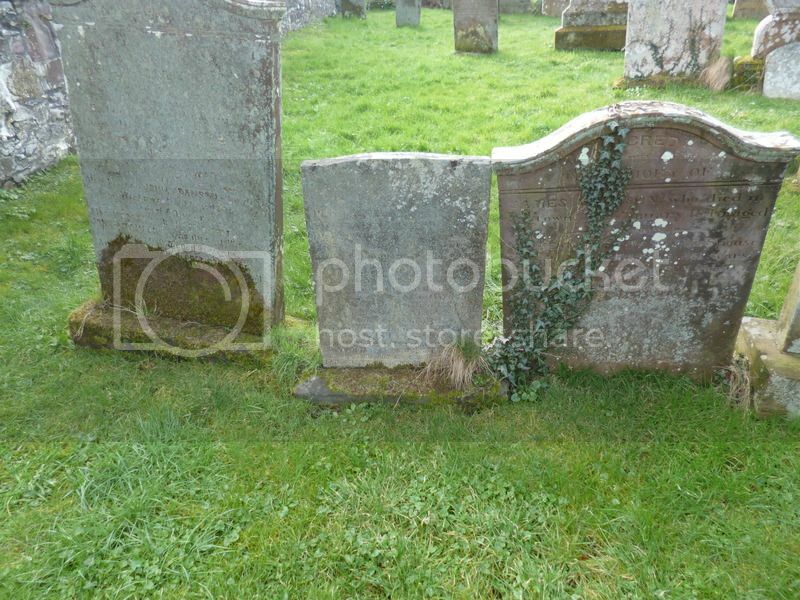 Additional information: Eldest son of the late William Paton and of Mrs. Annie Paton, of 15, North Main St., Wigtown. Born at Barrachan. 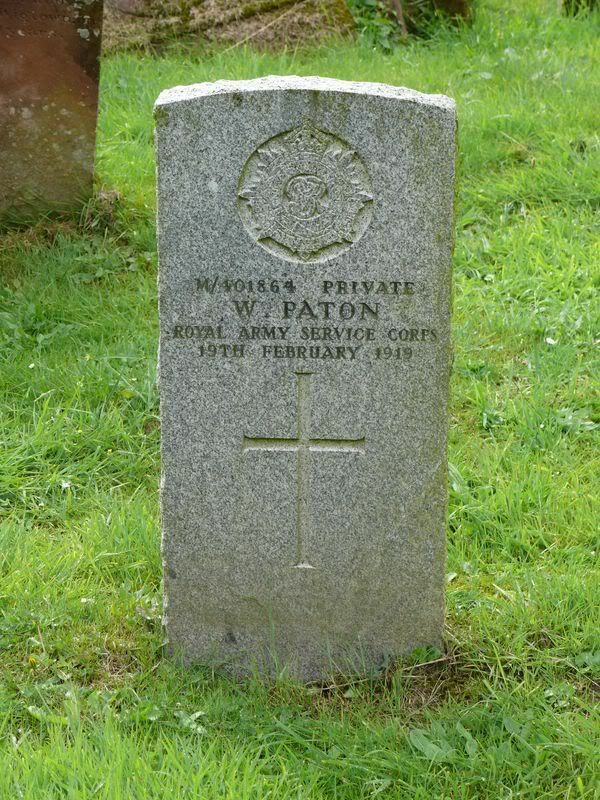 William Paton's name is also on the family headstone situated close to his CWGC stone. 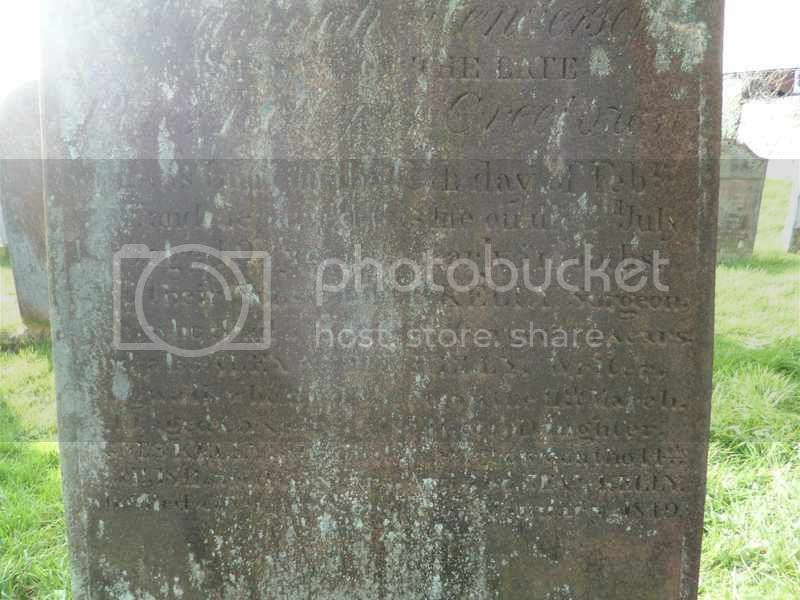 Sadly it is broken but the full inscription reads: Erected by William Paton in memory of his son George who died at Bladnoch 26 February 1879 aged 13 months. Also in affectionate remembrance of John Paton his son who departed this life 31 August 1888 aged 4 years and 8 months. Also Donald Walker Paton his son who departed this life on 2 November 1900 aged 7 years and 8 months. 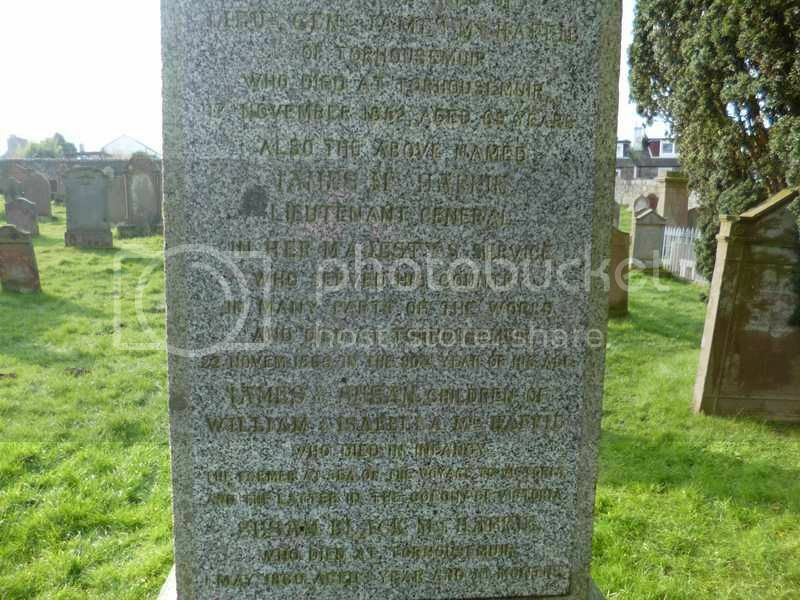 Also the above William Paton, farmer, Barrachan, who departed this life on 18 January 1906 aged 66. Also Annie Paton his daughter who died at Barrachan 1 March 1912 aged 24 years. 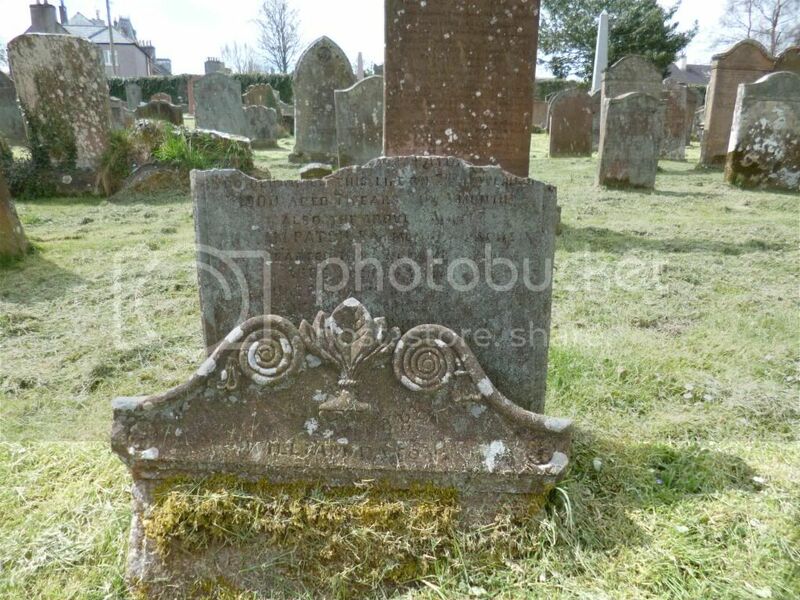 Also Annie McCulloch his wife who died at Craigend, Dumfries, 25 November 1932 aged 84 years. Also his son William Paton RASC who died at Cambuslang 19 November 1919 aged 43 years. Lt John Black was mentioned in despatches in May 1918. He was wounded by shellfire near Courcelles while attempting to repair his Whippet tank and subsequently died of his wounds. The inscription reads: Erected by Alexander Knowles in memory of his children John Andrew died 11th Jan 1902 aged 5 years 9 months. Elizabeth died 23 Dec 1903 aged 1 year 10 months. Alexander died 1874 in infancy. Also his mother-in-law Margaret Griffin died 23rd April 1889. Also Alexander Knowles 1/5 KOSB killed in France aged 32. Also Robert William Knowles killed in Battle of Gaza aged 23 years. 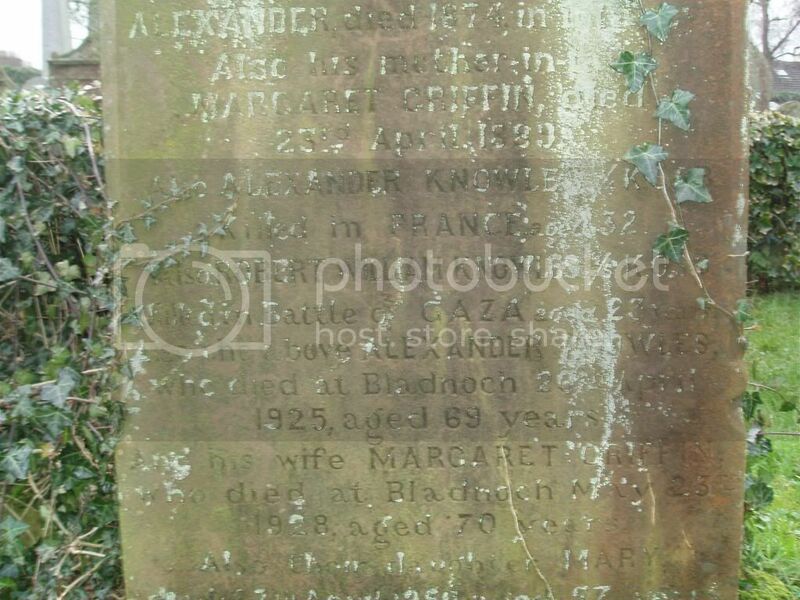 Also the above Alexander Knowles who died at Bladnoch 28th April 1925 aged 69 years. 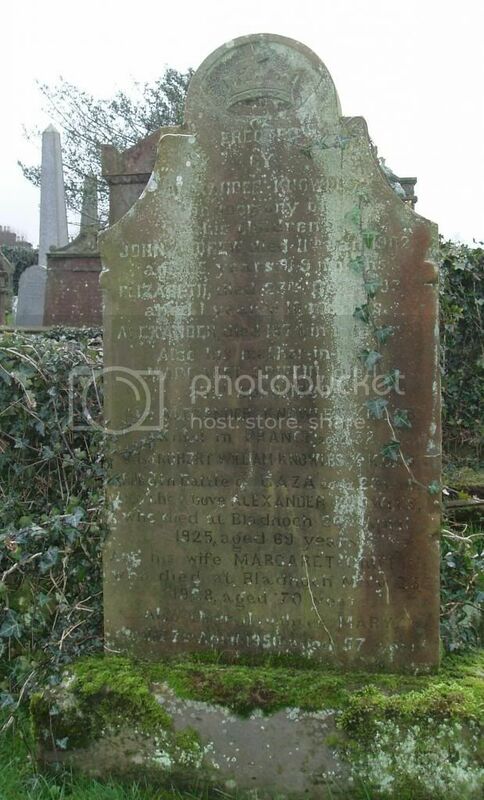 Also his wife Margaret Griffin who died at Bladnoch May 23rd 1928 aged 70 years. Also their daughter Mary died 27th April 1956 aged 57 years. 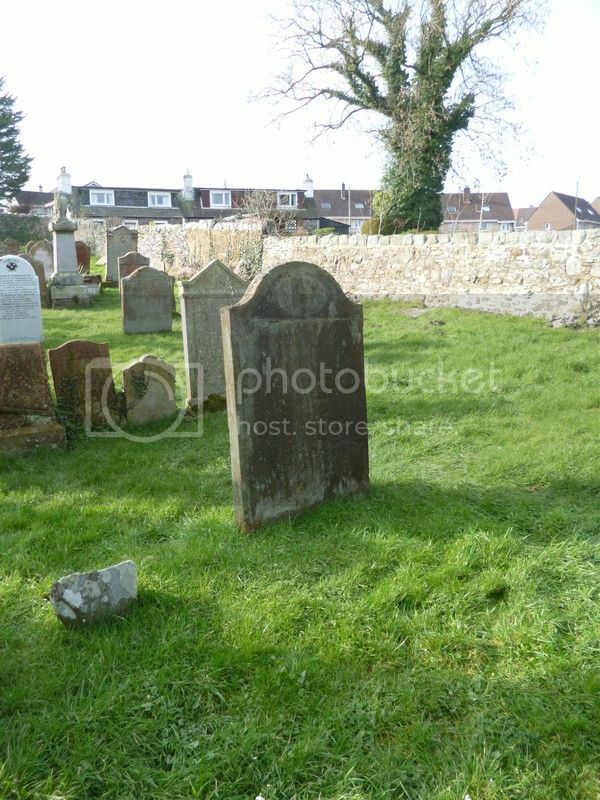 The headstone is broken in 3 parts and the inscription has been derived from a survey of the cemetery in the late 1970s. It reads: Erected by Sarah Croney in remembrance of her husband Francis Croney who died at Wigtown on the 5th Septr 1877 aged 62 years. Also their first born, Mary Ann aged 2 weeks. And their daughter Catherine aged 1 year & 2 weeks. And seven others all of whom died in infancy. 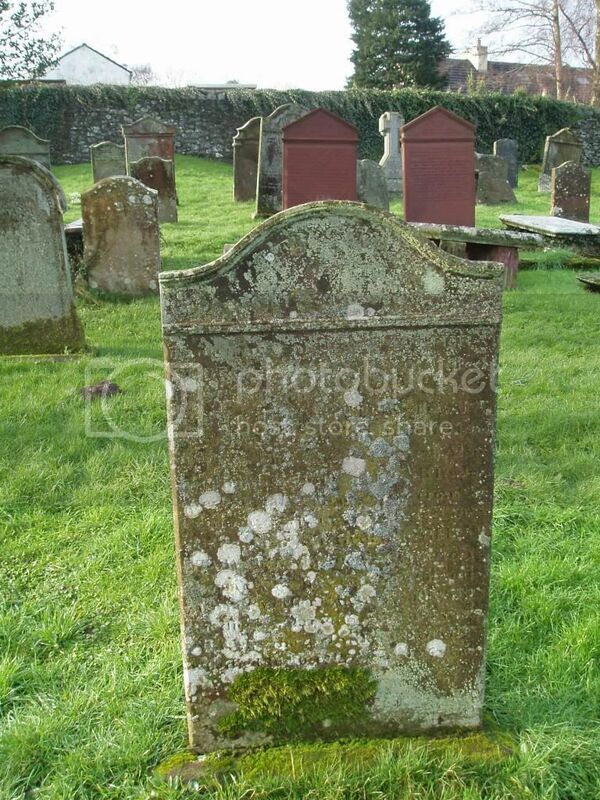 Also the above Sarah Croney who died the 2nd September 1882 aged 63 years. Also Francis W Kennedy their grandson who was killed in France 10th April 1918 and was interred at Ypres. Also George Kennedy their son-in-law who died at Wigtown 30th July 1918. 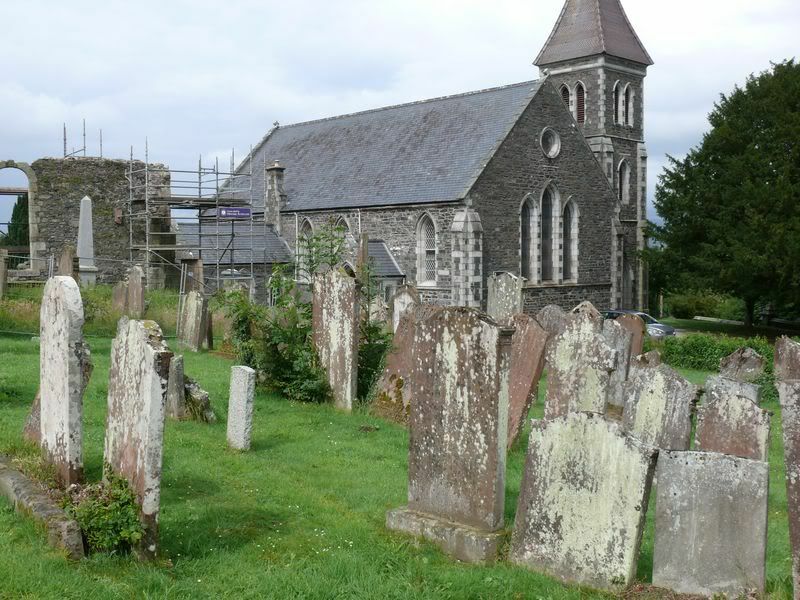 Also Mary Ann Kennedy, daughter of the erector who died at Wigtown 8th Octr aged 79 years. Rest in Peace. On 4th May 1918 the Galloway Gazette reported: Word has been received that Pte Frank Kennedy, only son of Mr & Mrs George Kennedy, Wigtown, has been killed in action. Previous to the war he was in business as a grocer, and was well known in the Machars which he travelled in his van. 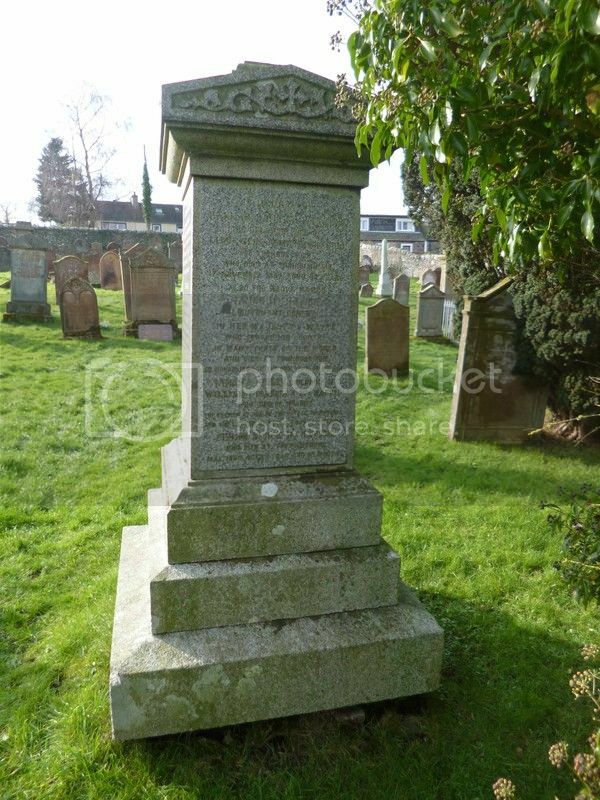 The headstone is in two pieces but includes: John Dun Simson, Lieut, 6th Bombay Infantry, second son of the said John Simson, who died at Baroda, EI, 2 July 1849 aged 27 years. This is a "possible". John Stewart may have been involved in the Crimean War. 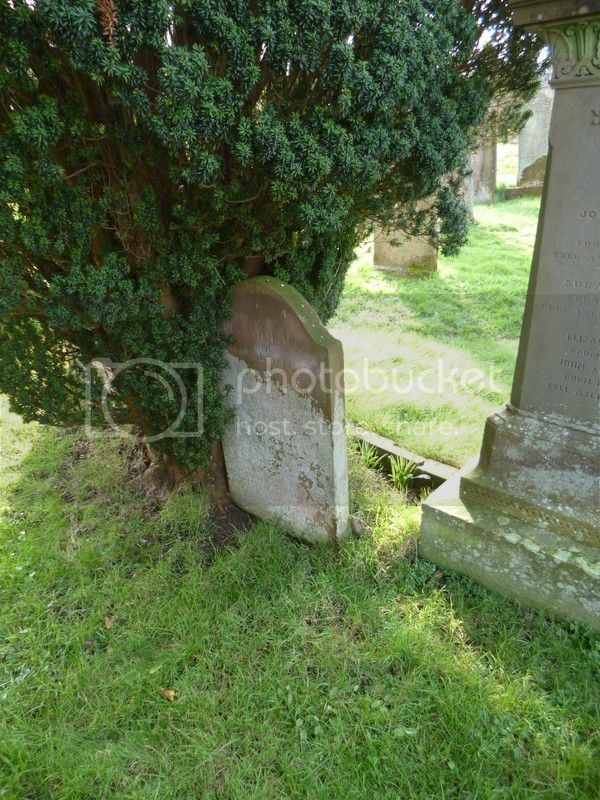 The headstone reads: Erected by Jane Stewrt in memory of her father George Stewart who died 12th Octr 1845 aged 83 years. 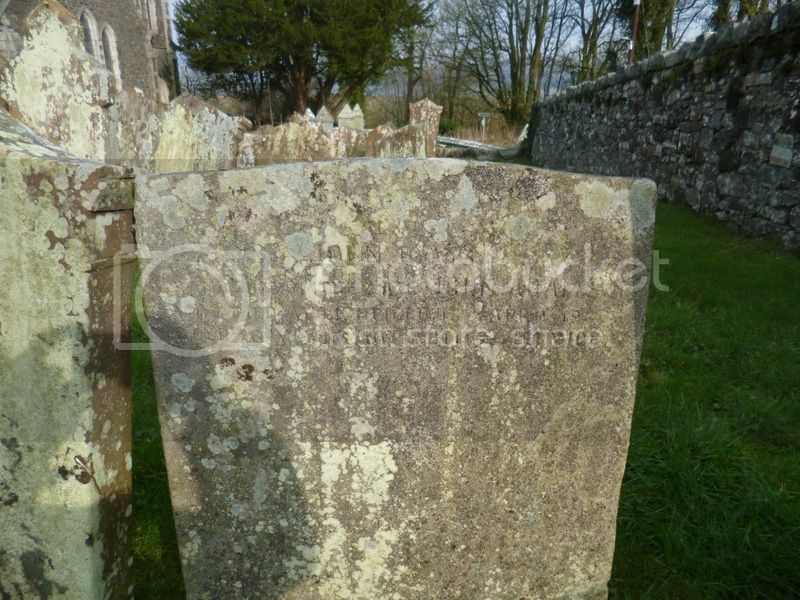 Also her brother Peter Stewart who died at Warrens Points, Ireland, 9th Novr 1837 aged 38 years. Also her brother John Stewart who died at Malta on his way from the Crimea 4th Febry 1856 aged 60 years. I think he should be here even if he was a civilian. He would have only have been in the Crimea at that time because of the war. We have other civilains such as wartime merchant seamen or diplomats on here so I think John Stewart, whoever he may have been, should be here. 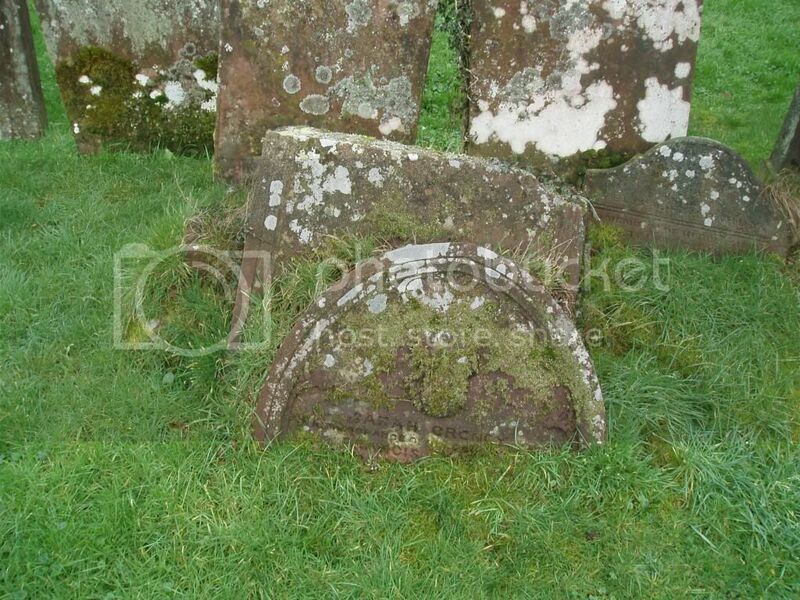 The headstone reads: "The burying place of Peter McKie, Burgess of Wigtown. Elisabeth Cowan, his wife, who died 8 Feby 1788 aged 64. And 6 children who died in infancy. And Elisabeth, their daughter, spouse of George Cunninghame, who died 17 March 1844 aged 49 years. Also Mary Frances Cunninghame Davis, granddaughter of the late John Adamson, Wigtown, who died July 18th 1920 aged 29 years. Late telegraphist of postal service, France." And on the West Side, "Also John Davis grandson of the late John Adamson, who died at Lichfield 13th April 1920 aged 26 years. On Active Service." 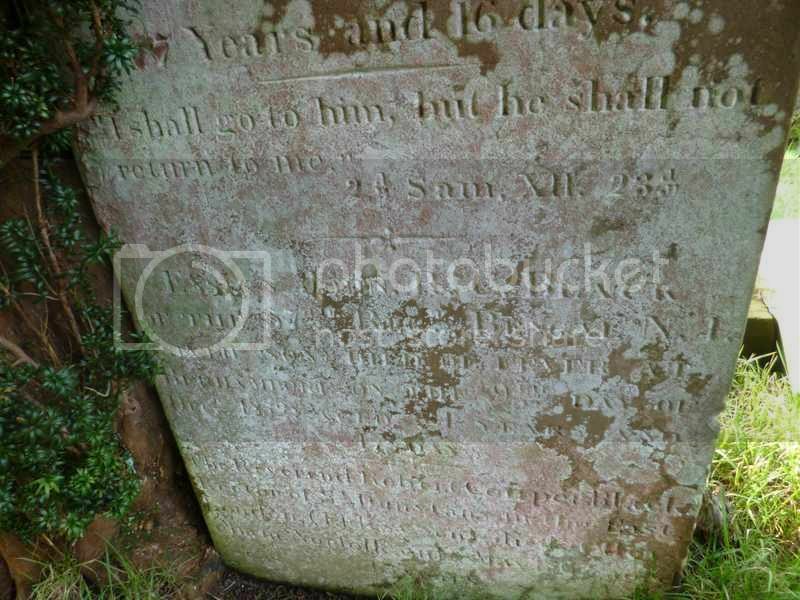 An image of John Davis actual gravestone can be seen on the Burntwood Local History Society website. I am also intrigued by the death of John's sister, who died in France, three months after he died. The 1911 census has John Davis living at 27 High Street, Wigtown, with his mother, Elizabeth, and sister, Mary Frances. He was a gardener and was born at Burton-on-Trent (not Wigtown as recorded by CWGC). He is named on Wigtown War Memorial, though his name was added later and is spelled "Davies". 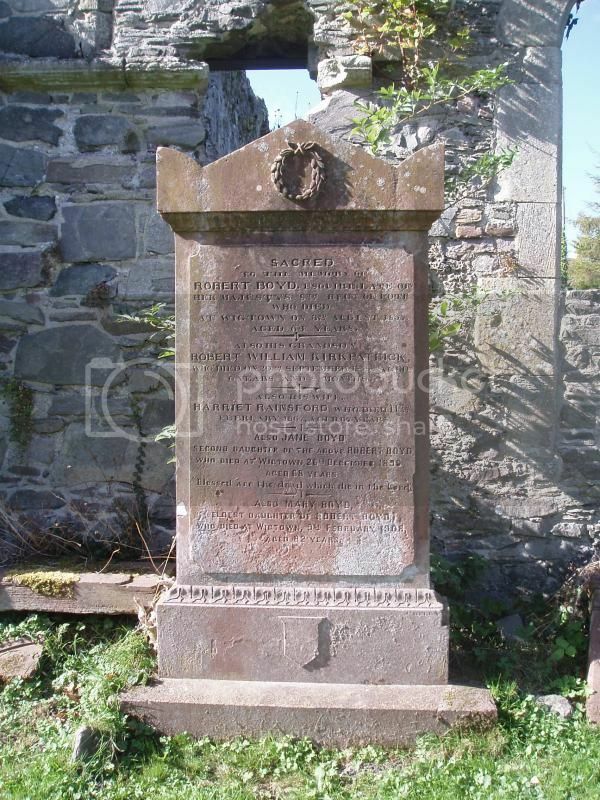 The headstone reads: Erected by Peter Shaw in Wigtown in memory of Alexander Shaw, his brother-in-law, who died 24th July 1834 aged 33 years. 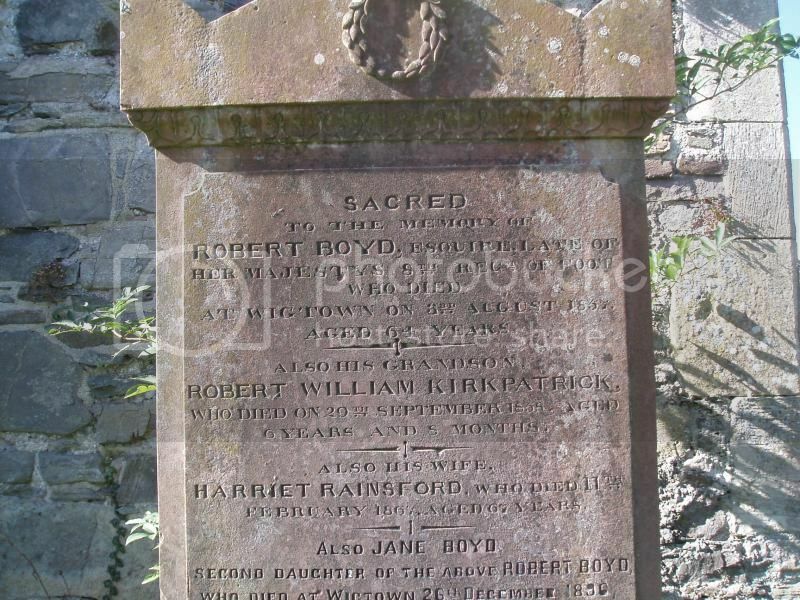 Also his mother-in-law Isabella McLean, late in Green Burn, Balhazie, who died 8th July 1836 aged 73 years. And of the said Peter Shaw RN, who died 22nd June 1856 aged 75 years. Also Jane Shaw, wife of the above Peter Shaw, who died 20th Novr 1872 aged 75 years. Wigtownshire Free Press (3/7/1856): At Wigtown on the 22nd ult, Peter Shaw, aged 76 years, one of four remaining veterans who fought with Nelson at Trafalgar and the Nile, in the Temeraire, next ship to the Victory at Trafalgra, where England's greatest naval hero fell. 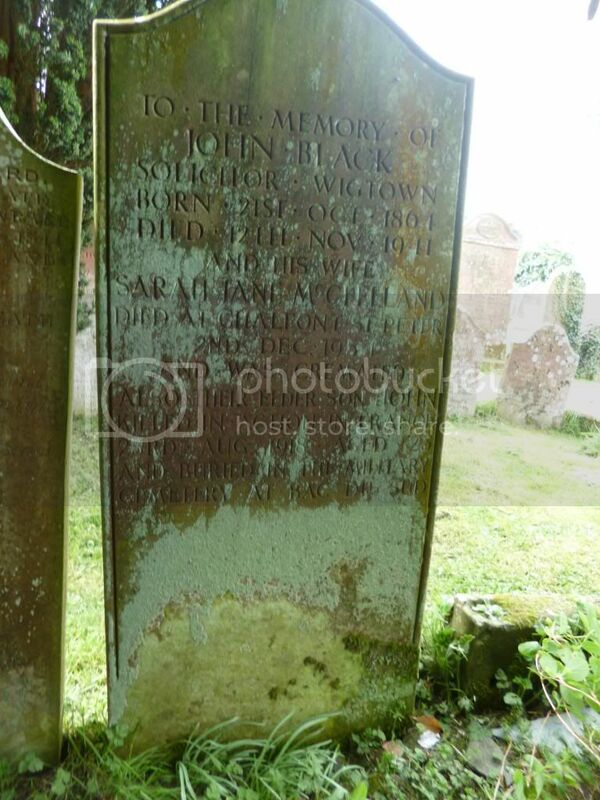 The gravestone reads: Ensign John R C Black of the 57th Regt Bengal NI (sixth son) died of fever at Berhampore on the 9th day of Decr 1852 aged 21 years and 17 days. 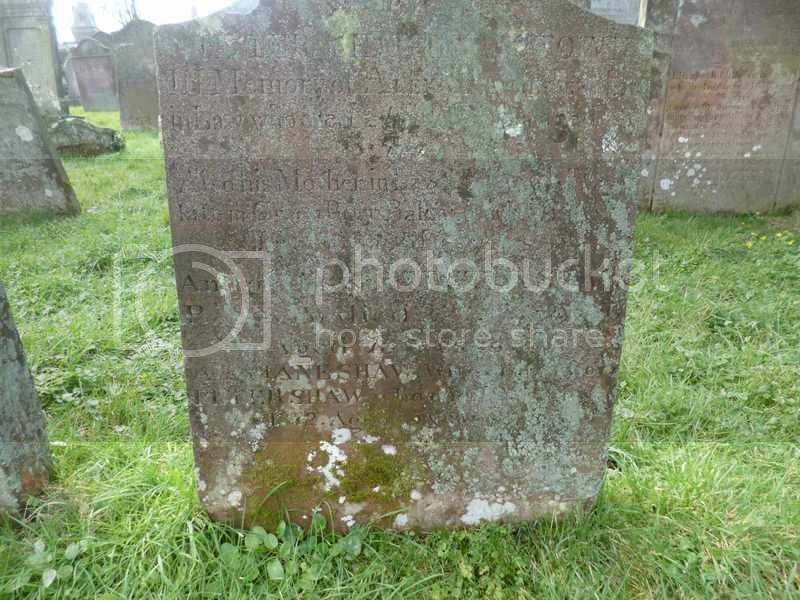 The stone reads: In memory of Hannah Douart Rankine, the beloved wife of Lieut Genl James McHaffie of Torhousemuir, who died at Torhousemuir 17th November 1862 aged 69 years. Also the above named James McHaffie, Lieutenant General in Her Majesty's Service, who served his country in many parts of the world, who died at Torhousemuir on 22 Novem 1865 in the 90th year of his age. 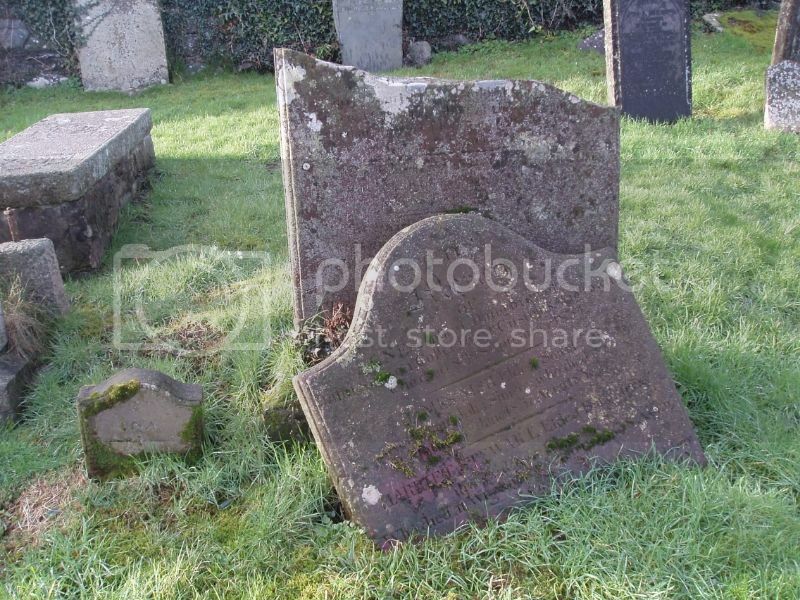 Gravestone reads: Erected to the memory of Hannah Henderson, spouse of the late Peter Kelly of Creetown, who was born on the 17th day of Febr 1837 and departed this life on the 3rd day of July 1829 aged 92 years and nearly 5 months. Also their son Peter Kelly, Surgeon, RN, who died at Cork 1820 aged 44 years.